Everyone that owns a vehicle will be responsible for numerous cleaning tasks. If you do not have the appropriate equipment on hand, you are pretty much going to be lost in all of the details. A handheld vacuum is a necessity, but it will be required to have certain features, before even it will be helpful. How the Black Decker BDH2000PL Works? Well, to break down each feature will be a difficult task, but starting with the pivoting action, one can see how helpful this could prove to be. The nozzle pivots up and down up to a 90-degree angle, to allow the user to reach into corners, underneath furniture, between cushions, and tall shelves. This feature also offers a compact storage option that is undeniably convenient for everyone. Once you have completed the cleaning tasks, you simply depress the button that is located on the handgrip, right below the on/off switch, while using the other hand to rotate the nozzle. Yes, it is that simple and you will be amazed with the vacuum’s easy operation. The BDH2000PL also has a convenient built-in upholstery brush, which is located on the very end of the mouth. When you are ready to utilize this handy dandy tool, just simply grab hold of it and flip upwards. Now, you will be able to clean your upholstery and carpet with ease. Plus the wide mouth allows the debris to be suctioned up into the vacuum, leaving the surface spotless. 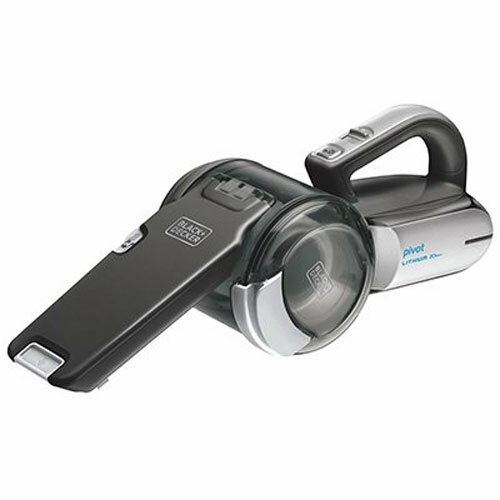 In order to determine whether or not the Black Decker BDH2000PL is right for you and your household, it is absolutely vital to examine the product’s most notable features. Once you’ve done this, you’ll have a much better understanding of its power, performance, capacity and true capabilities. This information will be provided below for your consideration. All in all, this Black and Decker vacuum is thoroughly impressive on paper. It is designed for effortless use, easy store and is truly perfect for quick cleanups. This is a bagless handheld vacuum that operates in a very cost efficient manner. ThePVF110 filter is located inside of the translucent debris canister. Emptying the canister is very simple and all you need to do is pop off the side, remove the filter, and empty debris into the trash bin. The filter is washable, so you can rinse it out underneath running tap water, whenever needed. The canister is completely sealed, allowing the user to rinse the inside out, without damaging the interior components. You will also have the option of removing the entire bowl, so you can clean it thoroughly. Once you have emptied the canister, just replace the filter and lid. There really isn’t much maintenance required on this vacuum, but it is very important to clean the filter on a routine basis. The BDH2000PL comes with a charging base, which also allows the vacuum to sit in an upright position for compact storage. As someone, who doesn’t want to get his or her hands dirty, you’ll want to make sure that you equip yourself with a reliable vacuum. This one is perfect for these individuals. It is lightweight, easy to use and very powerful. During operating, the consumer won’t have to worry about getting dirty or breaking a sweat. Instead, the vacuum will do the work, so you do not have to! At the same time, this vacuum is incredibly cost-effective. The consumer will never have to worry about spending additional for bags or filter! If you want an affordable, easy to use vacuum, this one is well worth examining in greater detail. The majority of individuals have been able to achieve at least 8 minutes of use from the battery, when it is fully charged. However, the manufacturer insists that 15 minutes is a possibility. This particular vacuum weighs just 4 pounds. It is supremely easy to tote the vacuum around in a single hand, regardless of your strength or stature. No. The vacuum is surprisingly audible. However, earplugs are not a necessity. Yes! This helps to make the product cost effective for the long-term. The cleaning process, which has been explored above, is quick and easy. At the end of the day, there is truly a lot to like about the Black+Decker BDH2000PL MAX Vacuum. The vacuum is superbly powerful, yet lightweight and easy to use. Thanks to its bag free operation and the washable filter, it is affordable in more ways than one. The battery life might be a hindrance for some, but 15 minutes should be more than enough for most. If 15 minutes is enough, the purchase of this vacuum is definitely a no-brainer. The vacuum can help make the consumer’s life a little more simplistic and that makes it a great purchase.